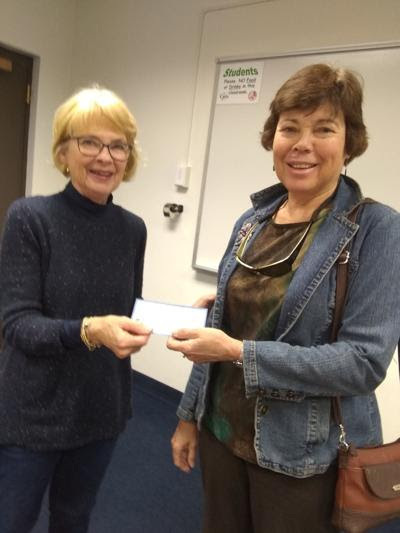 Jeanne Casella, left, of the Friends of Rim Country Gila Community College board, receives a check for $500 from Ruth Fleming, right, treasurer of the Payson Book Festival. The Arizona Professional Writers, Rim Country Chapter, promoters of the Payson Book Festival, have offered a scholarship each year for the past four years to a student studying communications at GCC. Payson Book Festival Thank You! Payson Book Festival made the FlightNetwork‘s list of best North American Festivals! Hurray for us! “USA TODAY YA bestseller a featured author at Payson Book Festival,” Payson Roundup June 29, 2018. 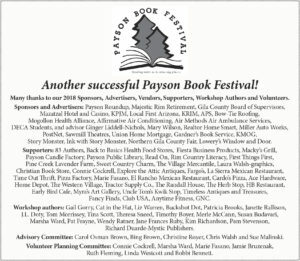 “Readers of all ages rejoice: the Payson Book Festival is on the way“, Payson Roundup June 5, 2018. “Rim Country’s hidden gem – Dee Strickland Johnson, AKA “Buckshot Dot”, Payson Roundup June 5, 2018. News release: June, City Sun Times article Reading Takes Us To Amazing Places, page 49.